Although we’ve still had some beautiful sunny weather this October, the temperature has definitely started to drop. The mornings are cool, sometimes with low lying clouds. The leaves are changing colours and falling from the trees. Fall is in the air. While at school one day this week I was feeling particularly chilled, despite the sunshine, and just needed to stop for a hot drink at good old Starbucks. For some reason, I wasn’t in the mood for my usual non-fat, unsweetened green tea latte, or my back up, the vanilla rooibos latte. Instead, another drink caught my eye. Um…say that again? Chocolate, caramel, and a sweet/salty combo? Where do I sign up! So I deviated from the norm, and placed my order for a tall, non-fat, with whip (hey, it’s hot chocolate – and you need something to hold up the salt!) salted caramel hot chocolate. I’ll forgive them for spelling my name wrong. Story of my life. 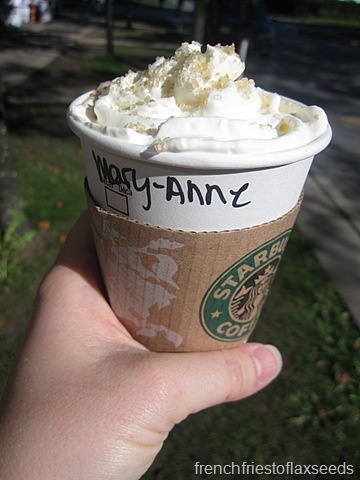 I was a little giddy to try my Starbucks treat. The barista told me it was really tasty, and sweet. 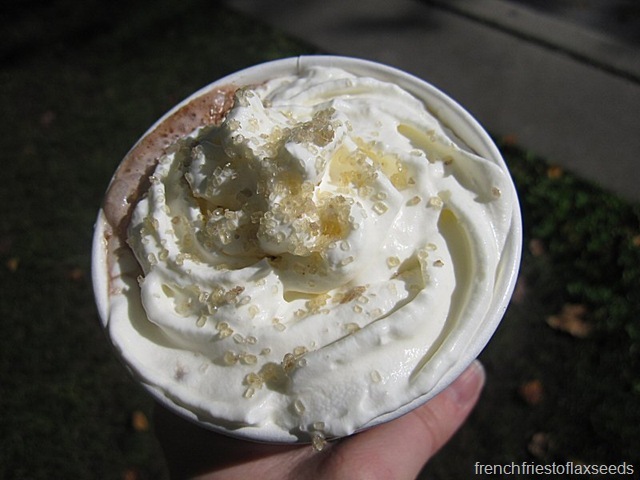 Well duh – it’s hot chocolate with caramel. Mmm, whip and salt crystals. So I took a sip. And it was good, especially when I got some of the salt. But then, the sweetness soon overpowered the flavours, and the salt was gone, and I was sad. I realize it’s hard to suspend the salt for long, considering it dissolves in liquid, and hello, this is a drink. 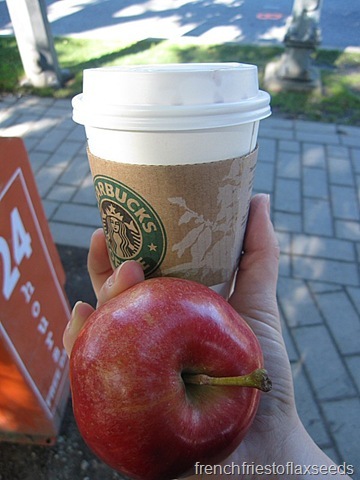 But Starbucks – does it need to be so sweet?! I know I could say the same thing about all their fancy drinks, but I genuinely wonder sometimes. Is everyone out there just looking for the taste of sugar, or do they want to taste the flavours of chocolate and caramel. I mean, you could do a bitter dark hot chocolate with the caramel syrup and I bet it would be 10 times better! As much as I liked the concept, and did enjoy the flavours, even a tall was too much for this blogger. Good thing I also had an apple to balance out my snack. Not that long ago one of my co-workers shared some salted caramel ice cream he made at home. Dear Lord it was good! Oh wow, that flavor has such potential. It sounds great, but I know exactly what you mean about those drinks being too sweet. Now when I go to Starbucks I always order half the syrup if I order a flavored coffee drink. That would be hard to do with hot chocolate though. I find any hot chocolate drink at bucks WAY too sweet myself. Makes my belly hurt. 😦 But hey…at least you tried it and now you know, right?? ?